The first Nordhavn 120, the new flagship series for Pacific Asian Enterprises, was technically launched earlier this week. 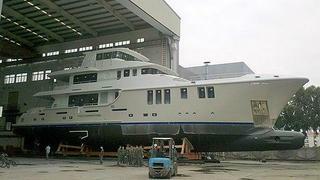 Now this explorer yacht is starting her tank testing during the next weeks. ABS classed, the Nordhavn 120 is a composite yacht with a length of 36.75m. She's designed by the in-house team with the possibility to entirely customise her. To follow the wishes of the owner, the first hull presents an enclosed sundeck and the interior is designed by Destry Darr. The first Nordhavn has a contemporary decor accommodating ten guests in five cabins: a full-beam master on the main deck, two VIPs forward of the engine room and a double and twin cabin aft. Crew quarters are for up to eight members. She's powered by twin economical 965hp MTU engines giving a cruising speed of 12 knots and an ocean-spanning capability. After five years from concept to launch, the first Nordhavn 120 will be delivered in early July. Then she will immediately start her maiden voyage from China to Vancouver.